Joakim Book | Life of an Econ Student: What's the Difference Between Economic History and History of Economics? What's the Difference Between Economic History and History of Economics? This is a question people have (rightly?) asked me on numerous occasions. Especially during my first semester in Sydney when I was studying both at the same time; obviously, then, people outside the nerdy game of economics would tend to get confused. I shouldn't blame them – but I guess I kind of did, probably rolled my eyes and said something snarky about googling it. Today, however, I feel more generous. Economic history and the history of economic thinking are indeed two of my most beloved topics. I enjoy both subfields of their various disciplines, as is quite evident from my undergraduate dissertation; amid a discussion of the banking crisis of 1847, I spend some 3000 words investigating and describing the mid-19th century controversy in Economics, between the Currency School and the Banking school. It's a dispute with remarkably much relevance for today (see for instance Capie et al 1994 or more recently Goodhart & Jensen 2015) and where many modern and interesting discussions are flushed out and/or foreshadowed: the quantity theory, price formation, inflation, monetary policy, currency regimes. 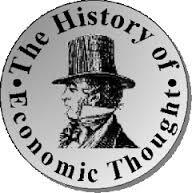 History of Economic Ideas (sometimes called 'history of economics' or 'history of economic thought') contains the various ideas and intellectual arguments economists and others have had concerning how the economy works, ranging back all the way to Aristoteles and beyond. Imagine debates by the Mervyn Kings, Bob Gordons, Krugmans and Pikettys of the past; the actual Keynes vs Hayek battle is a good illustration. History of economic ideas deals, naturally, with the realm of ideas, of writings, of ivory tower academic thinking, if you wish. Scholars in this subfield read the Wealth of Nation and History of Economic Analysis pretty religiously (and quote from them as much as they can! ), compare and interpret what economists of the past wrote, meant and argued. Andrew Bettie at Investopedia explained it very neatly: 'Economics is the science that concerns itself with economies, from how societies produce goods and services to how they consume them'. The history of economic ideas, then, is the dramatic changes in how economists have perceived the economy, what forces and laws they believed governed it at various points of time in history. Economic History is the history of economic matters. It is history, clensed from its incessant focus on politics, war and empires, instead focusing on trade, markets, prices. Human action, if you will. It uses scattered data on prices, statistics, documents, institutions, literature and any other tool available to any other kind of historian, applying those to the field we consider is 'the economy'. Economic historians are economists 'with a high tolerance for dust' as Robert Solow famously said, using their knowledge to describe events and economies of the past. You can research economic history without much regard for history of economic ideas, and you can devote yourself entirely to the history of economic ideas without doing much economic history. And, of course, there's a avalanche of positions in-between, with weird people like me who much appreciate both. Is there room in your wide-ranging curiosity for a conversation about the possibility of considering Finance as how society chooses which ideas for creating by design prosperous adaptations to life's constant changes can, should and will be evolved through enterprise, and the evolution of different financial decision-making people, places, processes and frameworks to fit the purposes of different economies at different times and places as a way to synthesize economic history and the history of economics, to fix Economics?